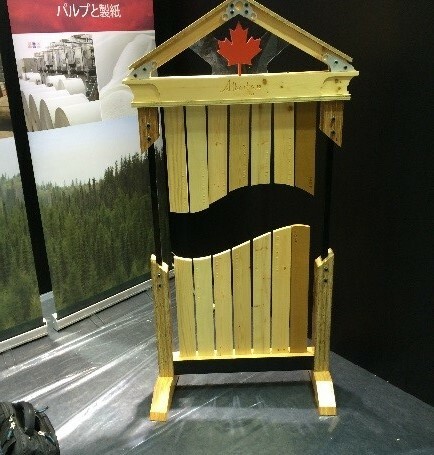 Promote Canada Wood and profile AFPA member companies at the Japan Home Show in Tokyo This includes finding out Japan’s wood product user needs and educating them on Alberta’s forest industry and products. 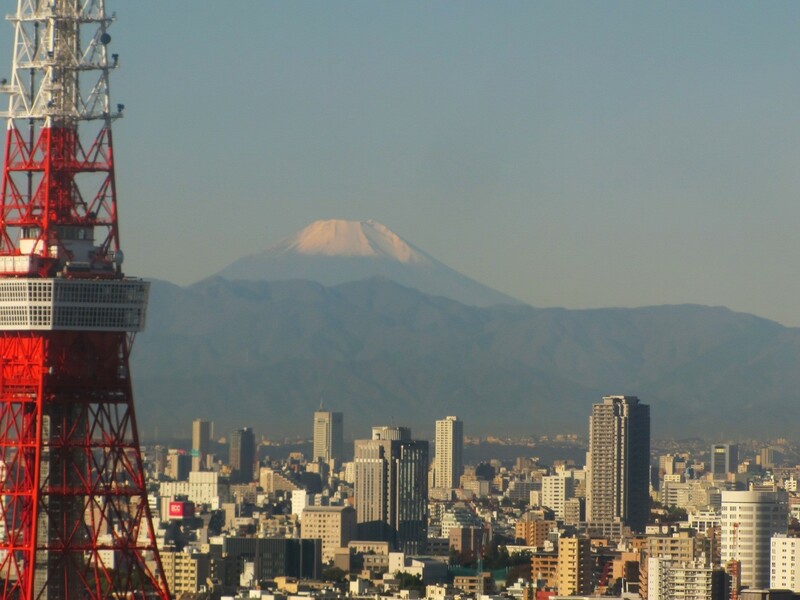 Continue business contact building by visiting key companies and associations in central Japan. 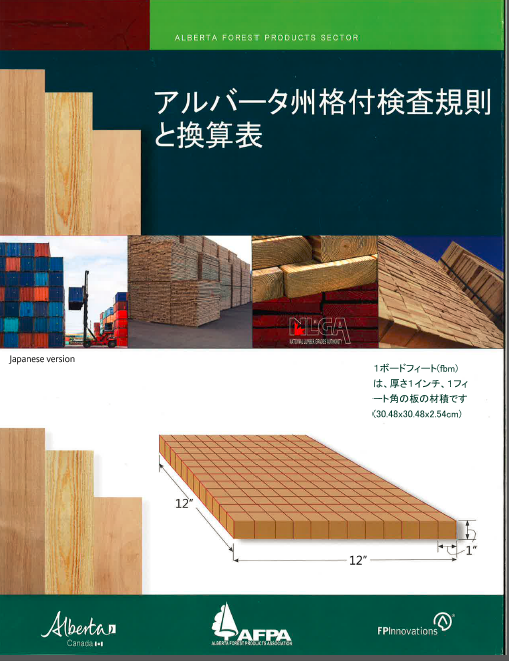 Make contact with various Japanese wood consuming companies to gather information as to how we can work with them and the Alberta wood producers to expand our market into Japan. The Consumption Tax has reduced spending in Japan and impacted some Japanese from entering the real estate market. The Consumption Tax is now at 8% and the government is considering the desirability of raising it to 10% in 2015. The housing market has seen a reduction of up to 15% in housing starts for 2014. In 2013 the Japan’s Ministry of Agriculture, Forestry, and Fisheries (MAFF) prepared a budget of approximately $400 million to promote the use of domestic wood in both new home starts as well as renovation work. The program allows for subsidies of Y300, 000 per home to the end-users, which means there is enough budget this year for over 100,000 starts under it. The average house size in Japan is 1100 square feet no basements (earthquakes) and cost approximately $380,000. Mortgage rates are around 2%. Japan housing generated 940000 housing starts in 2013. 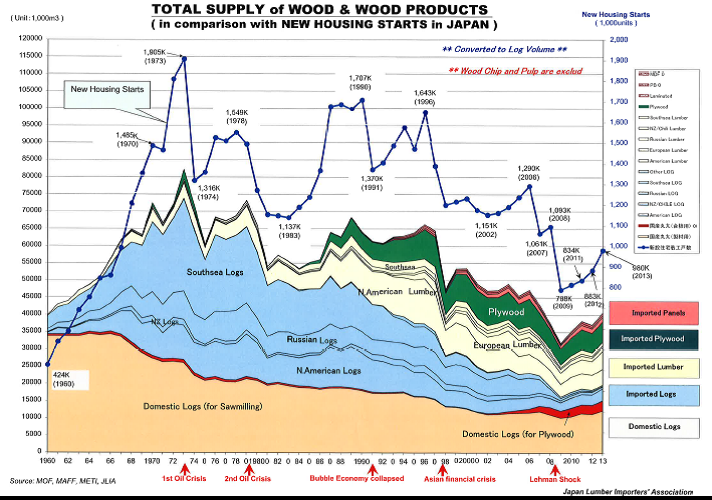 Demand and prices for J-grade lumber (the main product on the market from western Canada) and wood frame housing construction are trending downward due to these policies and the economic situation described further in this report. After the 7.1% GDP contraction in Q2, Japan’s economy continued to move sideways through September. The trade deficit for the first half of 2014 reach a record 5.4 trillion yen. Although exports increased 1.7%, rising fuel imports compounded by a weakening yen added to the overall trade deficit. The Nikkei 225 equities index fell 6.0% from the beginning to late October. The Japanese yen firmed to the 107-108 to USD level. Despite recent meetings in Sydney, Japanese and US trade officials failed to make any breakthroughs on the TPP negotiations. More importantly in a bid to rein in spending the Finance Ministry is now examining plans to increase the minimum number of pupils per class in elementary schools from 35 to 40. The move is expected to result in the layoff of 4,000 teachers nationwide. In addition the Ministry is reviewing plans to close up to 3,325 schools across Japan and lay off up to 18,000 teachers in areas with dwindling populations. However, these proposed cuts have yet to be confirmed. Japan total housing starts dropped 12.5% to 73,771 units in August, posting the sixth consecutive monthly decline. Owner occupied starts fell 22.7% in contrast to rental units which retreated 3.8%. Total wooden starts fell 15.1% to 40,667 units. By housing type post and beam dropped 16.6% to 30,239 units; pre-fab fell 12.0% to 10,727 units and platform frame starts eased off 9.4% to 9,183 units. By segment 2×4 starts fell 16.5% for owner occupied custom homes, 14.1% for built for sale spec homes and 3.9% rental housing. Average floor area also experienced declines of 4% for post and beam, 5.2% for pre-fab and 3.3% for 2×4. August BC softwood exports to Japan totaled 166,723m3, down 25% of year prior results. 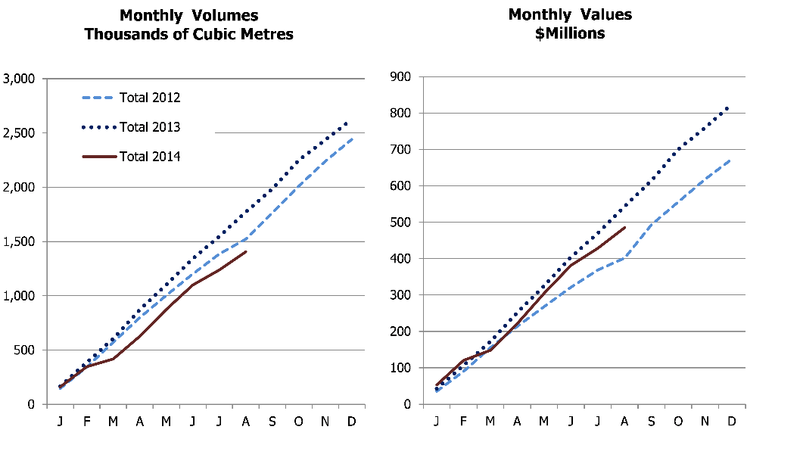 The value of August BC softwood exports fell to $56.4 million from $73.6 million the year prior. Year to date BC exports through until the end of August totaled 1,404,883m3 compared to 1,770,725m3 over the same period in 2013. The Canadian Pavilion at the Japan Home show was top notch, well designed and well attended. 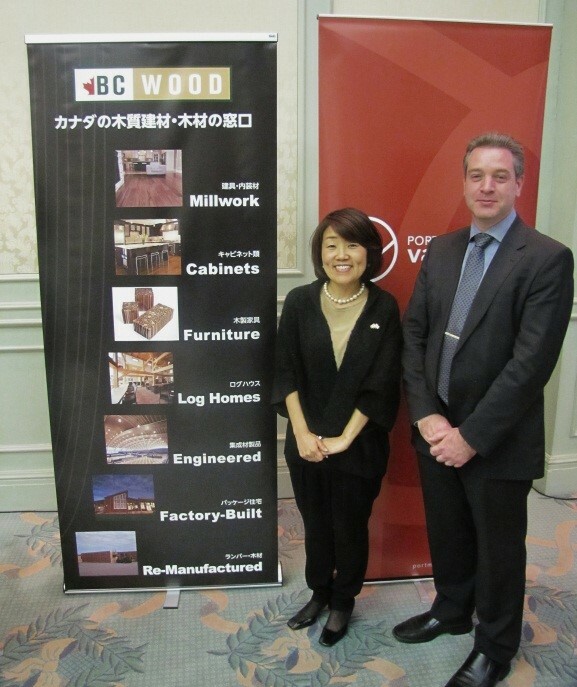 Thanks to BCWood for excellent mission support and hosting the Japan Home Show Pavilion. .Four days were spent setting up and manning the booth at the Japan Home Trade Show. The AFPA, ESRD and BC Wood had booths beside each other at the trade show located at the Big Site in Tokyo. Over the three day period there were many people that stopped by our booth out of those that walked by we actually sat down and talked to about 30 different companies regarding Alberta forest products. We have been in contact with those people through emails as a follow up to the show.